In the world of government budgets it pays to move fast. React too slowly and the national conversation around budget priorities has already moved on. This is one reason that IBP insists that a government’s failure to release budget information in a timely manner is tantamount to it not being released at all. This is also why the Centre for Budget and Governance Accountability (CBGA) publishes our analysis of India’s Union Budget within 24 hours of it being presented to parliament each year. This analysis helps to facilitate an informed budget discussion, particularly around sectors and issues relevant for the poor and vulnerable sections of the population. This year, alongside our analysis, we decided to launch an online Budget Analysis Tool. Aimed at policy researchers, economists, journalists, social scientists, civic technologists, as well as the general public, the tool aims to demystify budget information and open up budget discussions to a wider audience. It not only allows people to examine CBGA’s own analysis with the latest budget data, users can also find their own trends and derive their own insights into the sectors, agencies, ministries, departments, and schemes that interest them. We wanted the tool to be simple, easy to use, and be available soon after the latest data were released, but the process for developing it took time and involved a lot of planning up front. The first phase in developing to tool involved creating prototypes of representing budget analysis from past datasets. These mockups were shared with both technologists and budget researchers, and the visual elements that shape our current design is an outcome of a consultative process between multidisciplinary teams specializing in social science research and data science. This tool was launched less than 72 hours after the data were released. Researchers with expertise in various sectors worked with the relevant budget data, while technologists focused on designing and programming the tool’s source code to generate basic graphs in easy-to-access layouts in which all information was filled in. We were able to work so quickly because the main functionality and design were “forked” (customized from existing code) from DC Action for Children Data Tools. This open source tool was developed through a collaboration between DataKind and DC Action for Children. Our team built on these freely available tools by further developing the code to plot various charts. The focus was on simplicity — hence additional sections were created for depicting figures along with their units, notes on data, and budget insights drafted by the researchers. The process, the code, and our analysis are all open-source, so that others can adopt and improve our tool. Preparing a budget analysis at such short notice is a challenging task by itself. This was followed by wrangling datasets to make sure they could be easily used in the tool, which was time-consuming and probably the most difficult part to automate. Also, when there is diversity in the datasets, it is all the more difficult to ensure consistency and balance in the visual elements of the tool. To ensure that everything looked and worked the way we wanted it to, multiple checks have to be put in place to validate the data and visualizations. 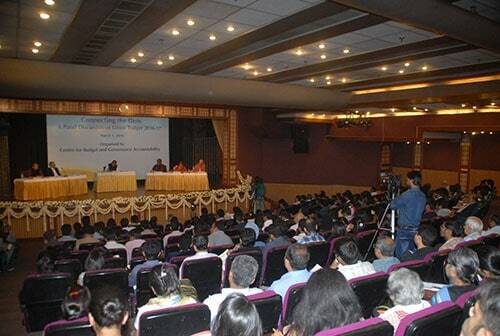 On the evening following the presentation of the budget, CBGA usually conducts a panel discussion with eminent economists, policy researchers, social activists, students, and the media. This time, along with distribution of several hundred printed copies of our analysis, the Budget Analysis Tool was also shared. We also presented the tool to various segments of researchers and civic technologists at other local events and created awareness through Facebook and Twitter. The Budget Analysis Tool had over 1500 visits in its first week. We received good feedback from various economists and policy researchers which we intend to incorporate into the next version. So far, we have been successful in raising awareness of the Budget Analysis tool in the researcher and activist communities. We have also been moderately successful in engaging constituencies of people who are more “budget curious” or “budget literate,” like civic hackers and journalists, over people who are “budget educated,” like civil society budget groups and academia. In our future budget analysis endeavors, we intend to reach out to more of the general public. Gaurav Godhwani is a civic technologist with CBGA. He can be reached at gggodhwani@gmail.com. Rohith Jyothish is a policy researcher with CBGA. He can be reached at rohith@cbgaindia.org.